On March 21, 2019, the "Arco Avon" suffered a lube oil leak in the engine room in position 50 58 19.0 N, 001 02 14.0 E with a crew of 10 on board on March 21, 2019. The dredger was moored at the Dungeness East anchorage. Repairs were carried out by the crew, investigations regarding the leak are ongoing. No pollution has been reported and mo assistance has been requested. Repairs were completed at 12.45 a.m.
On July 26 an orrdnance was found by the "Arco Avon". The EOD was notified. The vessel was under way to Southend anchorage to meet with the EOD. There were 12 persons on board, which also included a pilot. The "Arco Avon", being in pos. 51 10 41 N 01 26 35 E, about 1.3 miles off Kingsdown, Kent, suffered a problem with its seized fuel pump on July 24, 2018, at 11.30 a.m.. Though there was a spare fuel pump, it took two hours for the completion of the repair work. The vessel restarted its main engine 3.40 p.m., heaved up anchor and proceeded on its voyage. The dredger was en route from London to Dagenham with a crew of 11 on board. 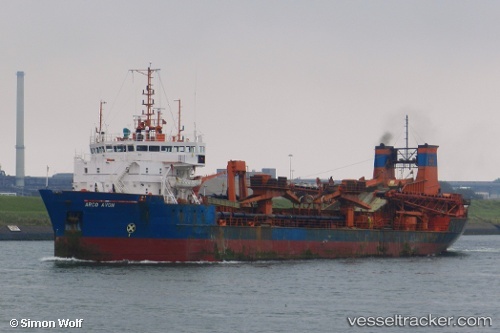 The vessel was carrying 145 tonnes of fuel oil and 2000 litres of lube oil as bunkers.